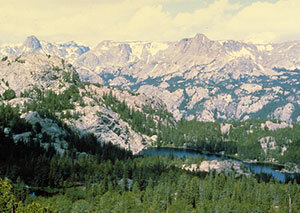 The United States Congress designated the Fitzpatrick Wilderness (map) in 1976 and it now has a total of 198,906 acres. All of this wilderness is located in Wyoming and is managed by the Forest Service. The Fitzpatrick Wilderness is bordered by the Bridger Wilderness to the southwest. Originally called the Glacier Primitive Area, this Wilderness holds 44 active glaciers (one spanning 1,220 acres) and many ragged mountain peaks in the northern half of the Wind River Mountain Range. Situated along the Continental Divide, this area displays incomparable beauty and grandeur. It holds 13,804' Gannett Peak, which is the highest point in Wyoming. The western border is the Continental Divide, shared with the Bridger Wilderness. The eastern border is shared with the Wind River Roadless Area, a part of the Wind River Indian Reservation. Carved by glaciers through granite and limestone rock, the area contains splendid alpine meadows, rocky plateaus, and stands of virgin timber. Precipitous canyons shadow tumbling streams, and granitic cirques hold more than 60 crystalline lakes. Many species utilize these mountains as habitat, including elk, mule deer, moose, bighorn sheep, black and grizzly bears, picas, bobcats, coyotes, wolves, mountain lion and a variety of trout. Named for Tom 'Half-Hand' Fitzpatrick, a mountain man and sometime partner of Jim Bridger, this Wilderness is extremely rugged with expanses of bare granite rock. Many miles of trails provide travel routes through this Wilderness. No season is free of frost, and snowfall is possible any day of the year. Planning to Visit the Fitzpatrick Wilderness? How to follow the seven standard Leave No Trace principles differs in different parts of the country (desert vs. Rocky Mountains). Click on any of the principles listed below to learn more about how they apply in the Fitzpatrick Wilderness.